2018 Finalists Chennai Super Kings and Sunrisers Hyderabad will face-off in the 33rd fixture of IPL 2019. 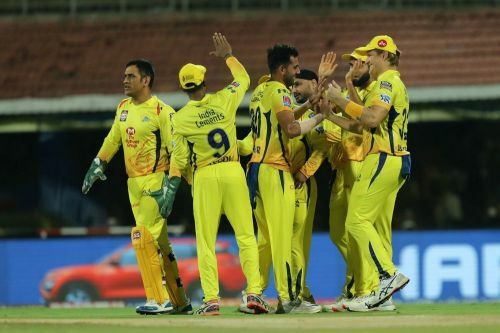 With an aim to put roadblocks in the Chennai Super Kings' great run, the Sunrisers Hyderabad will welcome the opponents for the 33rd fixture of IPL 2019 at the Rajiv Gandhi International Cricket Stadium in Hyderabad on Wednesday, April 17. Head-to-head overall IPL stats: The Chennai Super Kings hold a spectacular record against the Sun Risers Hyderabad. CSK have won 8 out of 10 matches played against SRH in the IPL. Head-to-head in Rajiv Gandhi International Cricket Stadium: The hosts have managed to beat the visitors just once in their three attempts in Hyderabad. CSK have been in great form again this year and have barely given any chance to their opponents. The table-toppers also hold a dominating record against SRH which certainly makes them favourites to win this game. Suresh Raina, who played a decent 58-run knock against the Kolkata Knight Riders, will be backed to have a similar impact against the Sunrisers. While skipper MS Dhoni (230 runs, six innings), Faf du Plessis (128 runs, four innings) and Kedar Jadhav (135 runs, seven innings) are playing their roles perfectly as they often get the team to victory out of nowhere. All of them are in good form and are expected to continue their role against SRH. Imran Tahir bowled a match-defining spell against KKR to restrict them to a below-par score of 161. The spell also stormed him into the second spot in the race for the Purple Cap. Deepak Chahar has been a consistent performer for CSK with the ball; he has ten wickets to his name and is not an easy hit for the opponents. Barring these two, Shardul Thakur will be Dhoni's go-to bowler during the powerplays. 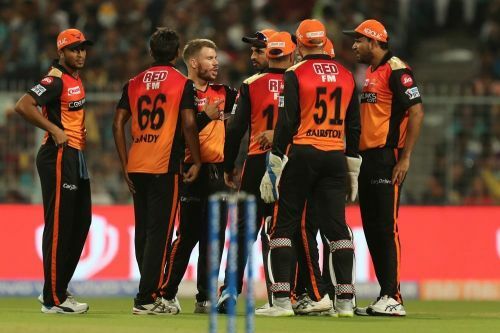 After an incredible start to their campaign, the Sunrisers lost their way in the middle and lost three games on the trot. Though they would love to come back strongly and avenge their last season loss against CSK. David Warner and Jonny Bairstow holds the key in SRH batting; both are the leading run getters for them and the management will need these two to get them to a flying start against CSK. While the return of skipper Kane Williamson is also a big boost for the team, though he fell cheaply last time, the Kiwi will be eager to lead them or chase down a contesting total tomorrow. Khaleel Ahmed made a commanding start to his season with the figures of 3/30 against the Delhi Capitals, and he will be backed to clinch a few scalps early on Wednesday, while Bhuvneshwar Kumar picked 2-33 last time out and looks set for another showdown here. Sandeep Sharma and Rashid Khan, who have picked up eight and six wickets respectively so far, have been consistent with their line and length. The duo have been efficiently putting constraints on the opponents scoring rate. Kane Williamson (C), Jonny Bairstow (WK), Manish Pandey, Wriddhiman Saha, David Warner, Vijay Shankar, Deepak Hooda, Rashid Khan, Bhuvneshwar Kumar, Sandeep Sharma and Khaleel Ahmed.